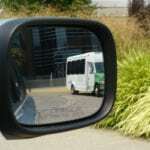 Corporate run buses shuttling employees to and from tech campuses are ubiquitous in Seattle. What is it like to ride one? And why are some transit advocates worried about them? JENNIE CECIL MOORE: When Ai-jung Li started working at Microsoft, she tried a few different ways to get to the Redmond campus from her home Ballard. MOORE: She’s tried public transportation. MOORE: Li finally decided to commute to work in a white tourist style bus run by Microsoft called a Connector. LI: I think after all this experience I decided to go for the Microsoft shuttle because I feel it’s more convenient for me and also I can always have a seat on the bus, I can have free wifi, I can do the work, or I can just rest on the bus. MOORE: Li said she could never get a seat on the public bus. Driving took too long. Meanwhile, the Connectors were convenient. There are over twenty routes running through Seattle neighborhoods like Queen Anne, Ballard and Belltown and in suburbs, like Duvall, Bothell, and Snoqualmie. Some well-used stops have as many as 13 pickup and drop off times a day. 3500 Microsoft employees commute on a Connector. Point is, a lot of people take these shuttles to work and it’s easy to see why. MOORE: Li spends about 20 minutes on the shuttle and says her door to door morning commute can be between 35 and 40 minutes. That includes getting to the shuttle stop and walking to her office. In the evening it’s closer to 50 minutes. All Li has to do is sign up for a ride using her employee ID online. LI: The commute is getting easier for me and also because it’s more predictable. So I can predict how long does it take for me to get to work or from work to home. MOORE: Employees save on personal commuting costs and arrive at work more relaxed. Companies can say they are reducing cars on the road and cutting down on emissions. The benefits to workers and the environment are clear. But there has been some pushback. In Silicon Valley, the private buses have been at the center of protests over gentrification. A few years ago, protesters blocked the buses on Capitol Hill. Longtime Seattleites can feel that the shuttles represent the new, moneyed version of their city. One that is increasingly expensive to live in. KATIE WILSON: I do think there is a danger. WILSON: And the danger is creating a two-tier transit system or even a city within a city. A privileged group of people that don’t feel they have a stake in the same public goods and services that the rest of us do. MOORE: Wilson is general secretary for the Transit Rider’s Union, a Seattle group that works on issues around public transportation. WILSON: The risk is creating this class of people who live in this privileged sphere that’s defined by and paid for by their employer who don’t feel that they’re part of the larger community and maybe don’t feel a sense of civic responsibility towards it. MOORE: Wilson acknowledges that the shuttles do have a place in the short-term – covering some routes or carrying high numbers of passengers that may exceed current public transit capacity. But, she says discussions across organizations could foster improvement to existing public transportation. WILSON: I think that what is first needed is a shared understanding on the part of local governments, transit agencies, and also the big tech companies that what we want to move toward is a world-class public transit system where we have frequent, reliable service, such that that’s what tech employees are taking. MOORE: In the past year, King County Metro and Seattle Department of Transportation permitted two private transit services to pickup passengers at public bus stops. Companies paid for the use of these stops and, according to researchers at the University of Washington, it didn’t disrupt public bus service. But Wilson is more concerned with the public’s perception of transit. WILSON: When we have transit ballot measures where we’re asking people to vote yes for public funding for public transit and other public goods and services, the more they feel that that’s not their thing. The more they feel that they don’t need that because they have the private buses, the private schools, the less support there is among voters in maintaining that really vital public infrastructure. MOORE: But, working with public transit can be a tough sell to industry leaders who make it their business to draw in top talent. And job seekers calculate perks like transportation to work into potential yearly earnings. Microsoft program manager Ai-jung Li says the shuttle was a factor in her job search. LI: I think that this is one of the reasons I decided to join Microsoft because I feel I don’t really need to drive and I have really convenient options for me to go to work. MOORE: Balancing the needs of public transportation as more employees opt for private transit is going to be important going forward, especially in a growing city like Seattle. Advocates on both sides will shape what it means to live and commute in the changing city. I’m Jennie Cecil Moore for Unmute the Commute.